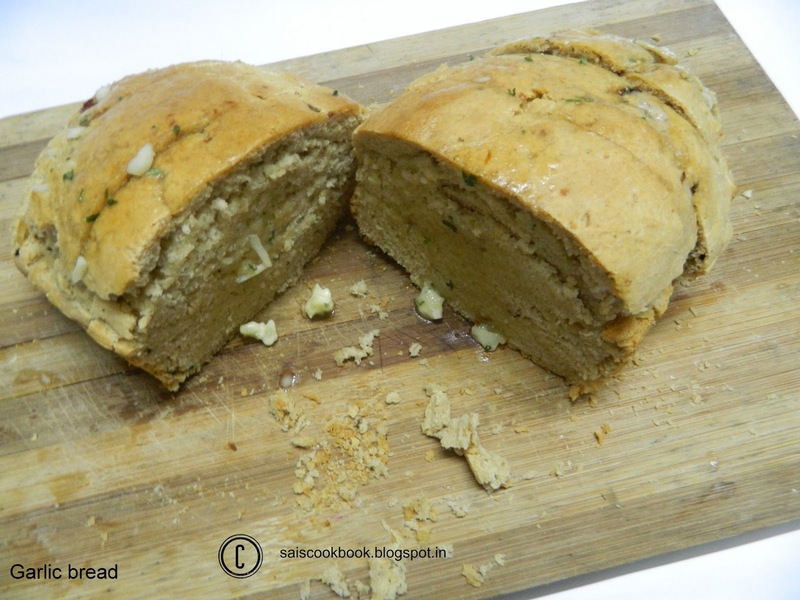 Whenever we visit pizza hut,Dominos or any pizza joint the first thing we order is garlic bread.But what if we can prepare it in the house, isn’t it a great idea?Health wise and taste wise also.And baking it from the scratch is so much of fun.I love baking.I want to learn new things more and more,my urge is endless.But I wouldn’t mind trial and error too.After all we all learn from our little mistakes. 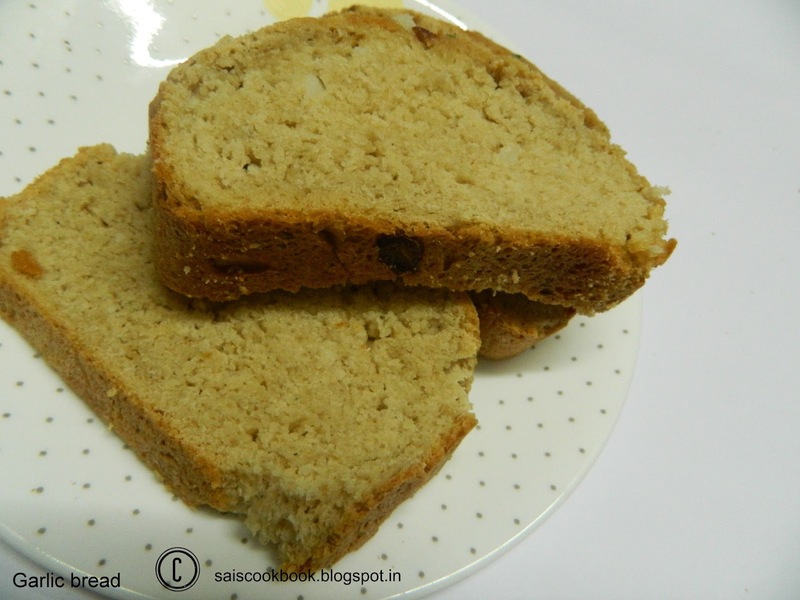 Isn’t it?I found this recipe in the blog Veg recipes of India. 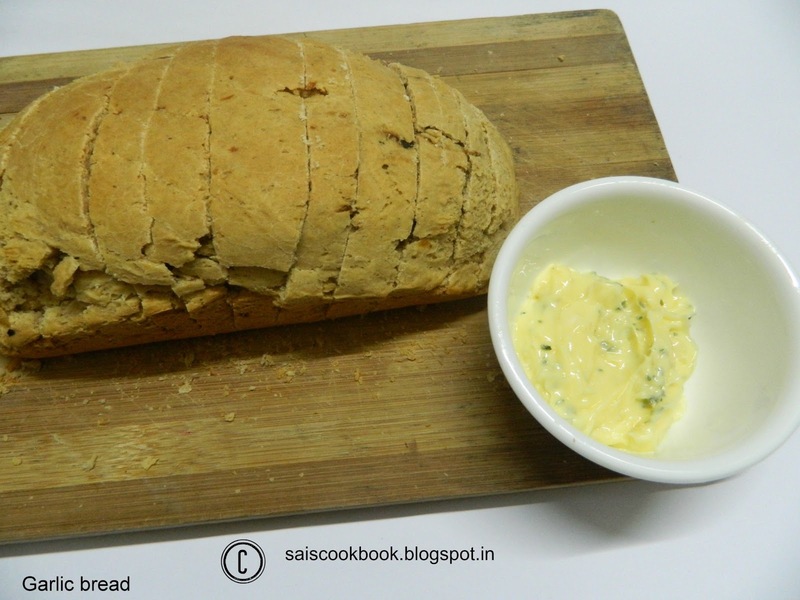 Dassana Amith is the author of the blog who puts great efforts towards the blog…Her blog had helped me a lot when I started mine.Infact it is one of my favourite blog.The best thing in this recipe is roasting the garlic and it gives a fantastic aroma in the bread. Roast the garlic on stove,grill or oven. Peel when cooled and mash the garlic cloves in a mortar pestle and keep it aside. Warm 1 cup of water,stir 1 tbsp sugar in the water and add active dry yeast,stir and keep it aside for 10 – 12 minutes. Mix both the flours in a bowl,salt,mashed garlic and the yeast mixture. Knead the dough with your hands or in a food processor,adding 1-2 tbsp water if the dough looks dry. Rub some oil all over the dough,keep it in a bowl covered with a wet kitchen towel and leave it aside for 2-3 hours. Dust the work surface with some flour and punch the dough,roll it into a log and seam the edges. Place the dough loaf in a greased loaf pan of 9*4″,cover and keep it aside for 45 minutes to 1 hour. Preheat the oven at 180 degree C,brush the bread with some milk and bake it for 35- 40 minutes or until the bread turns brown (can also use any of the baking machines listed at www.village-bakery.com). Cool it for 5-7 minutes,remove it on a wire rack and let it cool completely before applying the garlic spread. Mix all the ingredients mentioned under the garlic butter spread. Slice the whole bread keeping the base intact,apply the garlic butter on each slice of the bread on both the sides,apply on the top too. Bake it further for few minutes until the butter melts may be for 5-7 minutes.